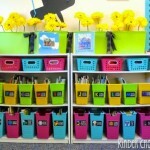 It's mid-July and teachers are beginning to dream, shop and set up for their classroom setup. 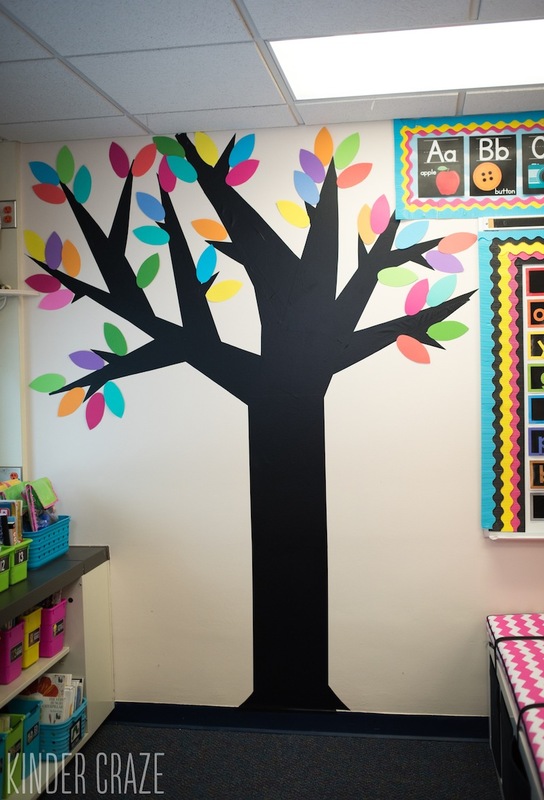 After reading about my kindergarten classroom, countless readers have requested more information on how I created the black trees that are displayed on my classroom walls. Today I am happy to answer all of your most-common questions and share a video tutorial to guide you through the process! What Are the Trees Made Of? The trees are not made of paper and they are not painted onto the walls. Rather, they are constructed out of vinyl. You can purchase sheets of black vinyl online, but mine came from Jo-Ann. I prefer to purchase them from Jo-Ann simply because they sheets are not sold in rolls. Jo-Ann lays them flat on a rack and the unrolled vinyl is much easier to work with when it's not trying to curl up on you. 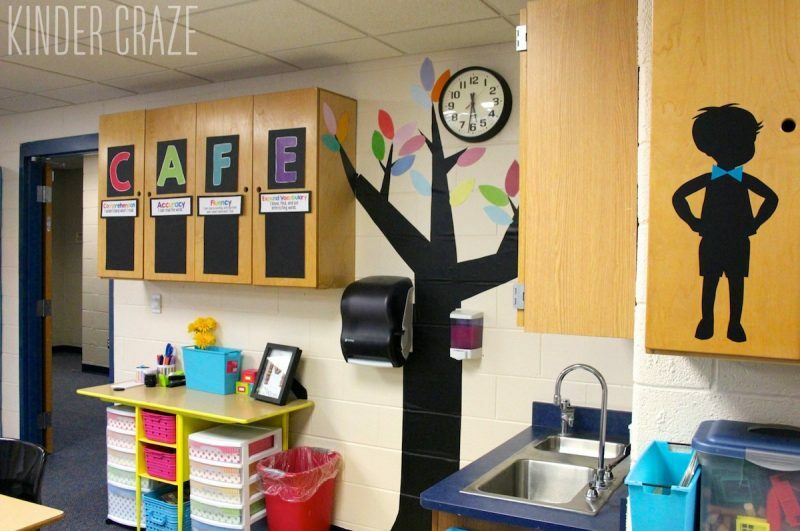 I knew I wanted to add trees to my classroom walls, and I carefully debated the best decorative way to add them to my walls. Paint was out of the question. 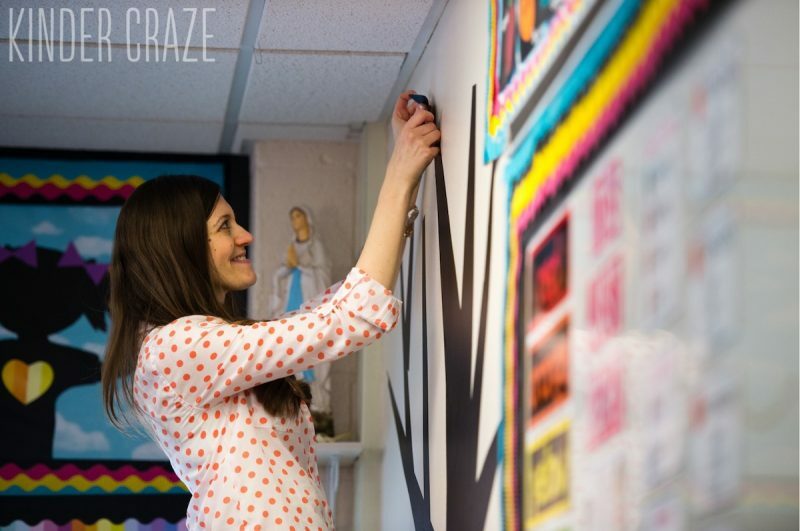 My principal allows me to do many things in my classroom, but asking to paint giant black trees on my wall would have been asking for too much! I also considered paper, but I didn't want to risk having the paper fall down mid-year. Most of the walls are cinder block and while I have a pretty high success rate with creations sticking to my wall, I didn't want to risk having giant trees fall off the wall mid-year. Vinyl was a natural choice for a long-lasting, non-permanent solution. It also would completely adhere to the wall and lay flat, unlike paper which would only stick in the places that had adhesive attached. The result was a smooth, polished look that everybody thought was paint! Did I Use a Stencil Or a Template? Not really! I constructed the trees as I went, beginning with the trunk. 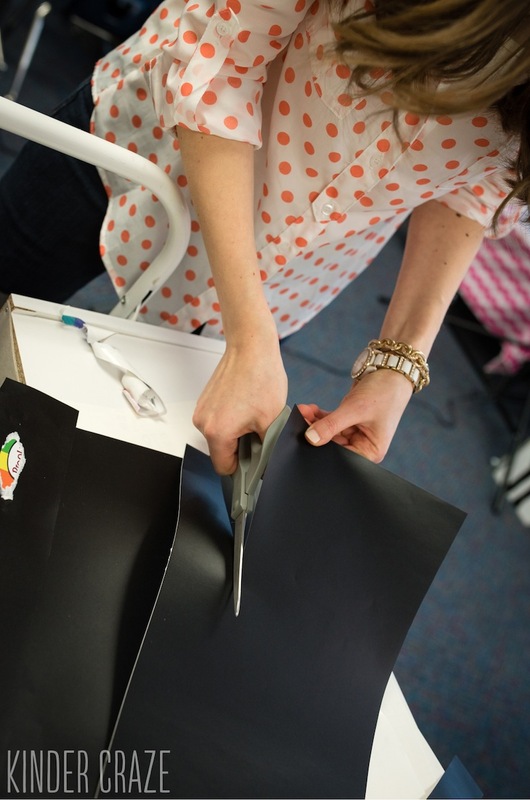 The sheets of vinyl I used were 12×18″ and they were the perfect size for constructing the trunk. The trees in my classroom used 2-3 sheets of vinyl for the trunk. From there, I created triangular offshoots from the trunk to be the branches of the tree, and smaller triangles were attached as twigs on each branch. There is no perfect method and I made plenty of mistakes along the way. Each time I placed a section of vinyl that I didn't like, I simply peeled it off and moved the piece to a different area of the tree. The vinyl is very forgiving of mistakes and I often put several small pieces together to build a larger section. What are the Leaves Made Of? Although the tree is vinyl, all of the leaves I added are cardstock. It's cheaper than vinyl and more colors are available. I didn't have a stencil for the leaves. Instead, I just drew them freehand, cut them out, and attached them to the wall with blue sticky tack. Since the leaves are lightweight, they stayed up all year long. I have two videos to share with you. This first video is a time-lapse without sound that lets you see the construction of a vinyl tree from start to finish. If you saw the time-lapse video and want to know more, this video is narrated to take you through the process from start to finish, including how I add leaves to the completed tree. 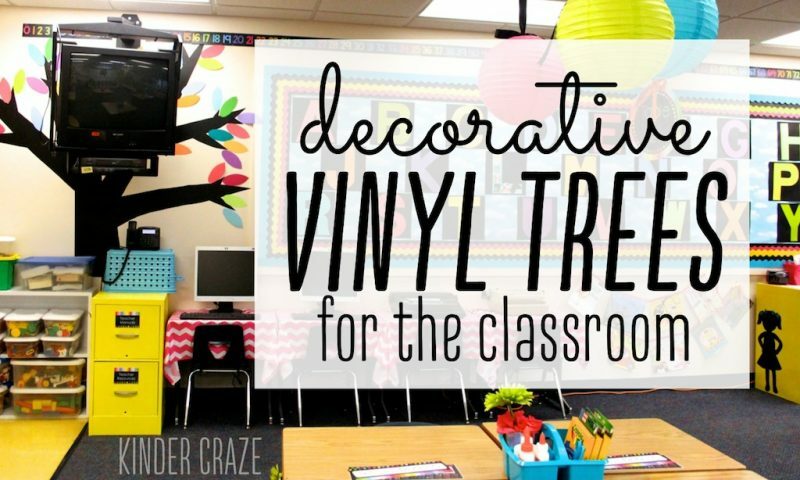 If you love the vinyl trees and want to see more of my classroom, take a tour in this blog post. 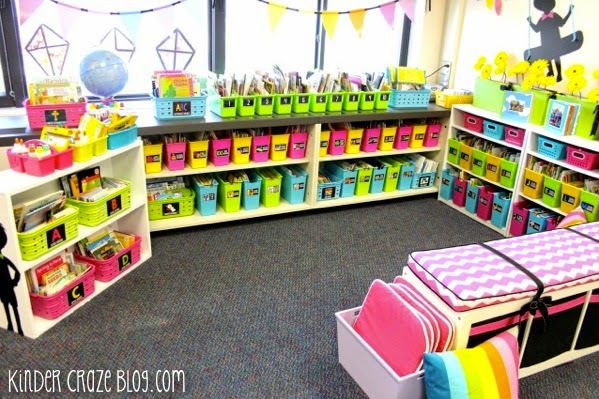 Organize your library like a pro! 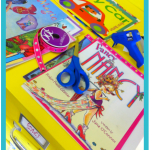 This blog post shows you exactly how I set up the library in my kindergarten classroom. 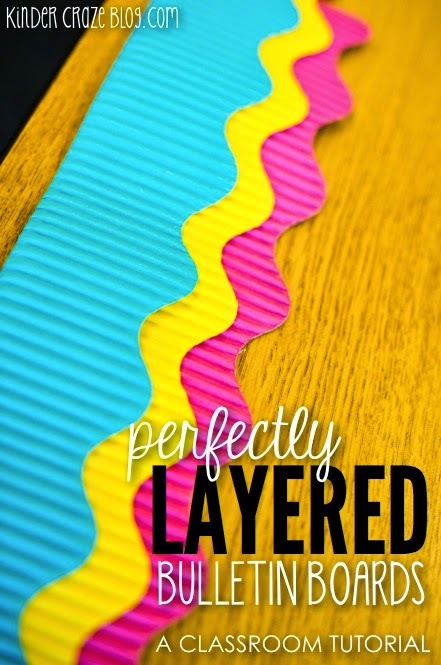 Add multiple layers of border to your bulletin boards with ease, thanks to this tutorial. 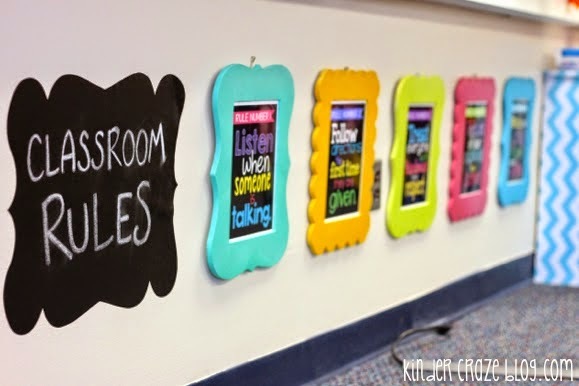 Learn how to recreate my classroom rules. And learn everything you wanted to know about the silhouettes of children on my walls and those bright yellow file cabinets. I hope you are enjoying every moment of your summer vacation. We will all be back in school before we know it! A giant thank you goes out to my friend Brian from BTW Photography. He shot some of the photos used in this blog post and he created the videos for me. Didn't he do an amazing job? 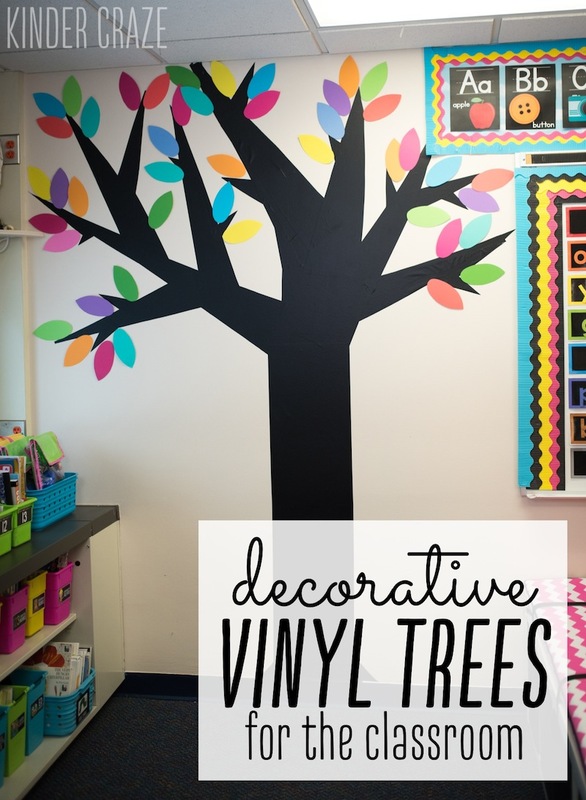 I love the vinyl trees and just about everything else about your room too! Everything is so crisp and clean and the colours just pop. I love the layered border on your boards! 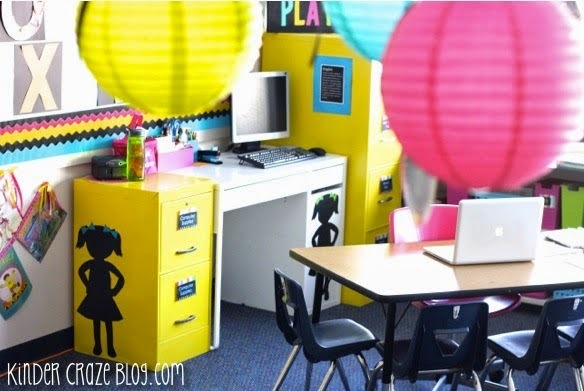 I remember seeing photos of your classroom awhile back and I absolutely LOVED the combination of black silhouettes and the bright pops of color. You made it look so easy to make that vinyl tree! I may have missed it, but did you cut out the pieces with a Silhouette? Just curious how that worked. I have a brand new classroom and I’m so excited because I think I can use vinyl on those walls. I’m doing an owl theme and really needed to put up a tree. This shouldn’t cause any damage to my brand new walls right? All of my vinyl came down with out any issue. Just make sure you buy indoor vinyl and nothing made for the outdoors. That stuff would probably be extra sticky. Thank you and it looks simple from what I see on the video. So this will be great! A few of my walls are cinder block and I didn’t have issue. It took a little more persistence to get the vinyl to stick, but once it was up, it stayed up. Maybe just buy one sheet and test it as the trunk of your tree to make sure it works before you get in too deep. I’m loving your room, your heart for your kiddos and the Lord. Thank you so much for sharing. 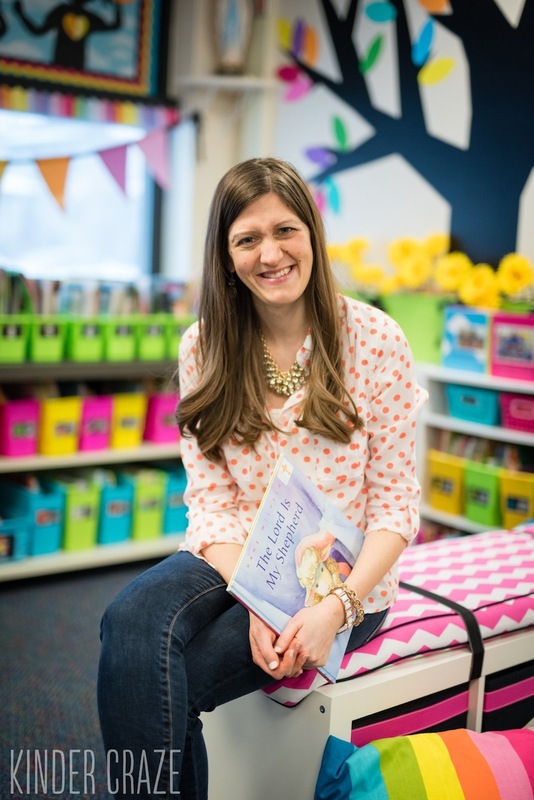 I’m moving from first grade to kinders, a good fit for me, and you’ve brought me tons of inspiration and resources. Thank you! Thank you Gini! Blessings to you on your adventure in kindergarten! I LOVE your entire classroom. So jealous as I don’t even have a classroom anymore. I will have to keep your tree method in mind! I love that green table in the picture with the tree! Where can I find it? I love your tree and your silhouettes! I wonder if it’s possible to buy white vinyl sheets and write on them with dry erase markers? My son is going to college and he cannot put holes in the walls. He wants a very large whiteboard to organize his college life…lol. What do you think? Do you free cut the large letters in your word wall? I love your word wall!!! I made myself cardboard tracing cards for those letters years ago and dig out my cardboard letters every year. 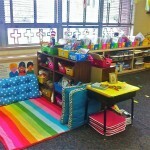 I LOVE your classroom! 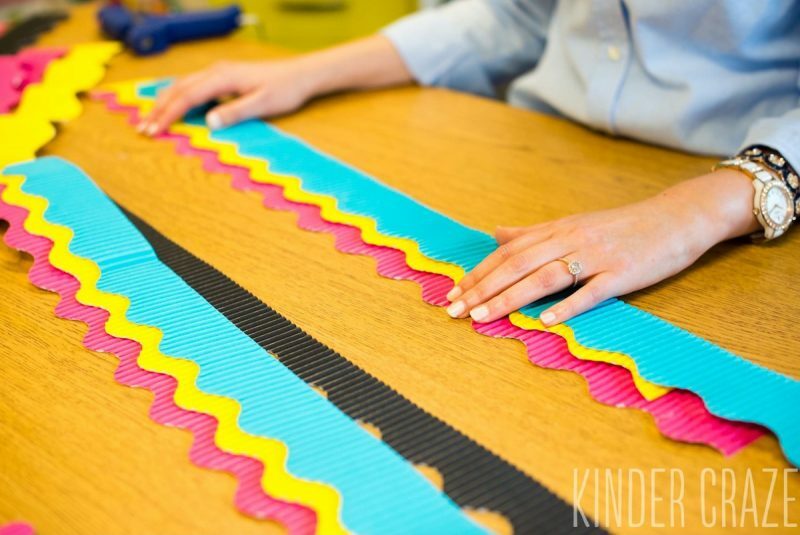 Do you know about how many pieces of vinyl was used to create the size tree in your video? Thank you Marleigh! I think I used about 6 sheets of vinyl on each tree. Thank you for sharing your positive energy, knowledge, and creativity. It inspires us to go further. Love your room! Where did you find the cushion for the 1×4 ikea cubby in your library area? I had the cushion custom made from some foam that I purchased and fabric from Hobby Lobby. Hi- Love Love your class!! 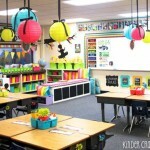 I am trying to do the same exact theme in my classroom and wanted to see what brand of vynl you used. I went to Jo Anns today but couldnt find any. Details would be perfect! I am a 3 and 4 year old Preschool Teacher. Every year teachers at our school have to pick a new theme for their classroom. 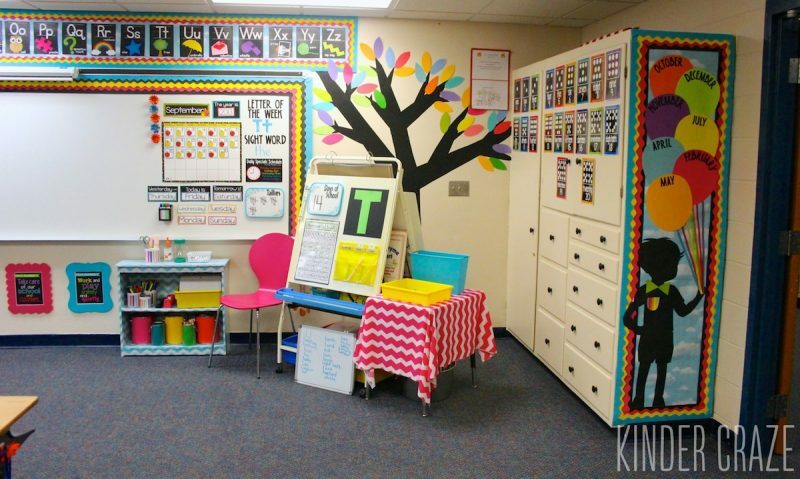 I saw chalkboard theme items at Michael’s crafts and bought them because I loved the idea but did not know what to do as the rest of the classroom. 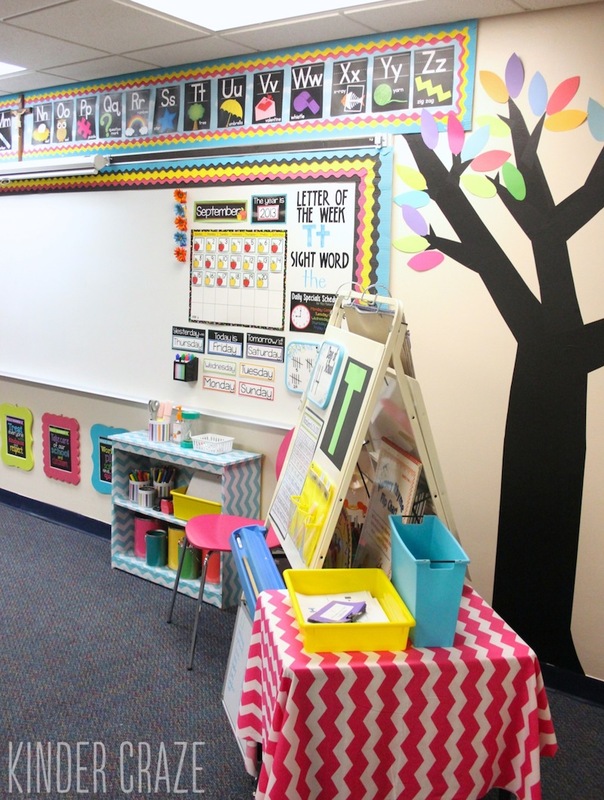 I saw your classroom online and love what you have done with the silhouettes and colors! I have made many decor’s for my classroom over the years as I am a local artist as well so it comes natural to me. I usually use the wood like contact paper from the Dollar Tree to make my trees on my wall as last year I did a whole wild forest theme with silhouette animals, trees and mountains it came really great! I am so excited to get started on my classroom for this year! I am going to try and make it as wonderful as yours is! Thank you so much for the ideas and inspiration! Thank you so much for your sweet comment. 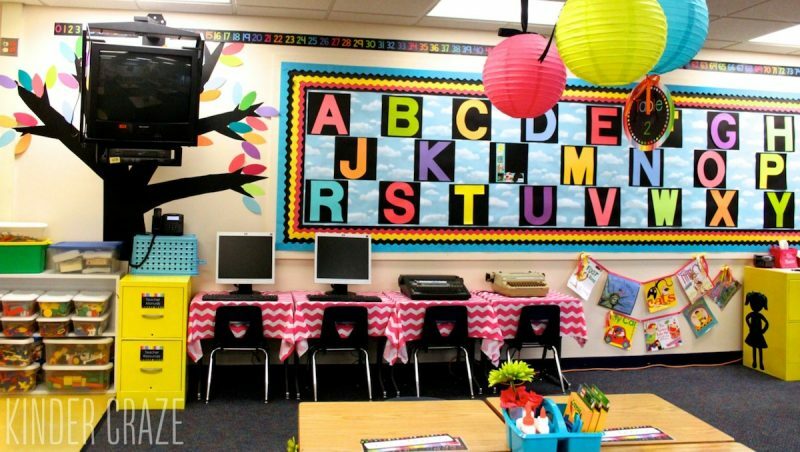 I’m sure your classroom will be beautiful this year. I also LOVE the idea of using the wood contact paper to make a tree! 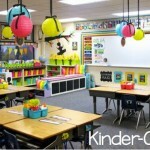 I teach 3 and 4 year olds and looking to brighting up my room this year. I love the alphabet poster cards you have above the dry eraser board. Did you create them? Love your room! Where did you find those frames below your whiteboard? 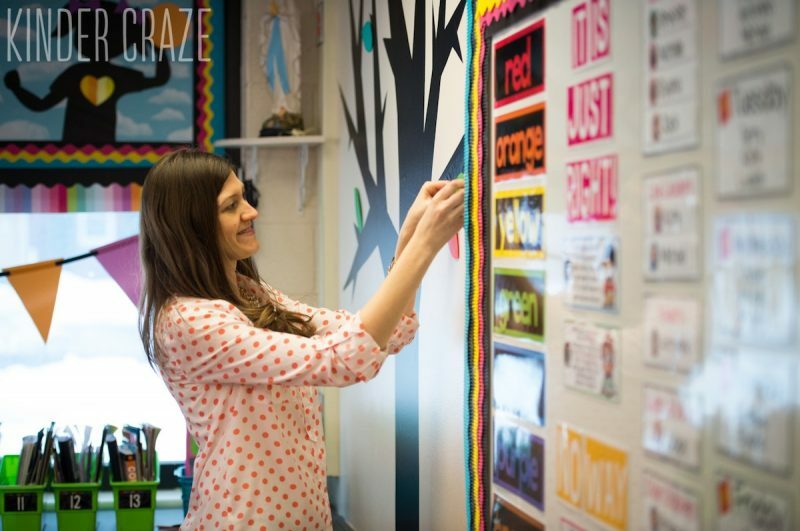 Love your classroom….such an invitation to fun learning! Lots of work went into this, great job! Hi! 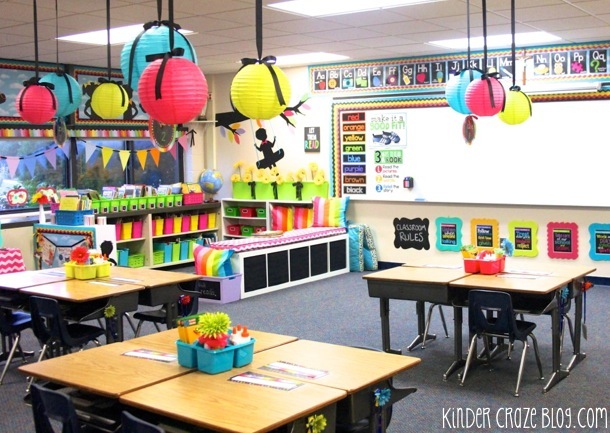 beautiful classroom! I’m wondering what sort of vinyl you bought as I headed to JO Anns and they only had vinyl that was not adhesive. The adhesive one came in rolls?